HÀ NỘI — Vietnamese shares ended on a negative note for the third session in a row on Monday as profit-taking pressure rose in the closing minutes. The benchmark VN-Index on the HCM Stock Exchange lost 0.51 per cent to close at 953.51 points. The southern market index was down 0.53 per cent on Friday to finish last week at 958.36 points, totalling a weekly loss of 1.2 per cent. The HNX Index on the Hà Nội Stock Exchange dropped 0.51 per cent to end at 107.55 points. The northern market index rose 0.17 per cent on Friday to end last week at 108.10 points, marking a weekly decline of 1.51 per cent. More than 187.6 million shares were traded on the two local exchanges, worth VNĐ4.1 trillion (US$176 million). The figures were down 1.8 per cent in volume and 8.5 per cent in value from Friday. From early morning until mid-afternoon, both the VN-Index and HNX-Index saw continuing growth. However, the indexes retreated on the rise of selling pressure in the final minutes. Declining stocks dominated the market with total 267 stocks seeing prices fall, while 171 other stocks ended on a positive note. Poor investor confidence continued to hit stocks on a large scale, led by large-cap ones after the VN30 Index fell 0.96 per cent to 922.75 points at the end of the session. Nineteen of the 30 largest stocks in the VN30 basket declined against only seven gainers, indicating investors were trying to offload their portfolios. Most stock groups suffered losses on Monday. 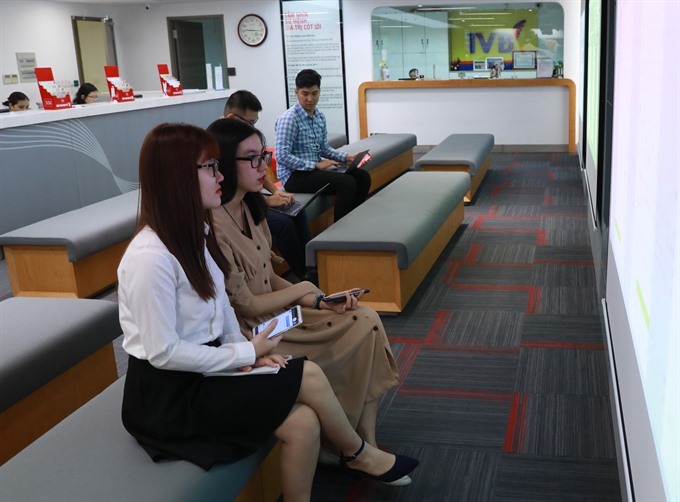 Bank stocks slid 0.68 per cent, dragged by Sai Gon Thuong Tin Commercial Joint Stock Bank (STB), Vietnam Prosperity Joint Stock Commercial Bank (VPB) and Vietnam Commercial Joint Stock Export Import Bank (EIB) which respectively dropped by 3.7 per cent, 2.7 per cent, 2.5 per cent. Securities stocks also slipped by 2.36 per cent on the slump of VNDirect Securities Corporation (VND), Ho Chi Minh City Securities Corporation (HCM), Viet Capital Securities Joint Stock Company (VCI), and MB Securities Joint Stock Company (MBS). VND, especially, hit its floor price. On the other hand, food and beverage climbed by 1.35 per cent, driven by Hanoi Beer Alcohol and Beverage Joint Stock Corporation (BHN) and Saigon Beer – Alcohol – Beverage Corporation (SAB) which respectively rose 3.9 per cent and 0.9 per cent, helping slow the slump of the indices. According to Bảo Việt Securities Company (BVSC), in the coming sessions, Q3 earnings results of listed companies will have significant impact on the stock market. The VN-Index may retest the point range 940-950 before confirming its next trend.